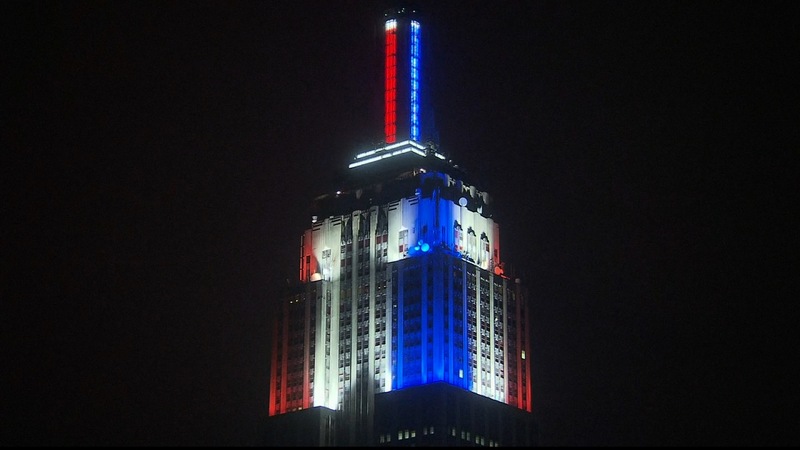 (CNN) - New Yorkers looking to see who’s winning the White House on election night just need to look up… to the Empire State Building. As CNN projects winners in each state, the iconic beacon of Gotham will be exclusively displaying the race to 270 electoral votes with a vertical LED illuminated “meter” on its spire—blue for President Obama, and red for former Governor Romney. And when CNN projects a winner in the presidential election, the full spire and upper floors change colors to either red or blue. In addition to the millions in at least three states watching history made atop this American landmark, which sits a quarter-mile above Manhattan, millions more around the world will see the results exclusively on CNN and CNN.com. Watch CNN's comprehensive coverage of Election Day starting at 6 p.m. ET on CNN TV and follow online at CNN.com or via CNN's apps for iPhone, iPad and Android. For up-to-the-minute results, go to cnn.com/results and for our real-time Election Day live blog, check out cnn.com/conversation. Need other reasons to watch Election Day coverage on CNN's platforms? Click here for our list. The money spent on these campaigns will dog us forever. The country where we are supposed to be so open about our government now allows donors to hide behind PACS. Just who gave this money and why? What is it they want because surely they do want something in return. The oddest duo – Romney and the man who accompanied him to Israel. This man made his money through the gambling industry. Funny thing is Mormons do not gamble and are opposed to it. They will, however, accept their money particularly for a presidential campaign. Money talks and the Romneys listen! everyone vote!!!! for romney!!!! make us school not eat wheat!!!!!!!!! Perhaps CNN ... should spend that money to help those who are suffering tonight. The money they aer spending to do their red blue trick would probably feed everyone in NY and NJ one nice warm meal ... Turkey (or Tofu turkey), mashed potatoes, gravy and vegies ... now that would have made me stand up and give CNN a thumbs up. When they light the building up in red, many people who are suffering will be helped, help that lasts for years and generations of Americans. Romney/ Ryan 2012. Just another reason why I rarely watch CNN. Just more silliness. With everything going on in the East Coast. CNN takes over the Empire State Building. ????? Definitely praying for a Romney win. Having family in NY, they feel this is something that shows NY just keeps on moving no matter what! They like it. That is awesome, beautiful, and really, really cool. It's funny how everyone is dogging CNN for "spending money" when Sandy victims are suffering. It's true that there is a lot of suffering and people need as much help as we can give them, but the Empire State Building already had these lights. It changes color for various events and holidays at times throughout the year. CNN isn't pulling the strings here but as they call states, building officials will be triggering the lights as applicable. Lets hope the sky lights up red tonight!!! I voted for Obama in OH, which a lot of my friends also voted early for him. Romney is dead. How is it that unemployment for African Americans are 14% and 16-19 year old African Americans are at 40%? How is it that unemployment for 16-19 accross all ethnicities are higher than the national average? Why do we not have answer for high poverty rates, high crime rates, high prison rates, high single parent rates in our urban areas. This is supposed to be a just country and even with a president that is an African American who has been speaking in the urban areas to motivate communities, we have had little, if any success. The last four years shoud have made great strides at discovering and improving our poverty issues. Instead we have health care that pwople in poverty already recived benifits in our system. They can not eat the affordible health care act, or sleep in it, or heat or cool themselves with it. I am saddend at a leader that should have given us the best hopes to understand and address poverty issues. Instead we instituted talking points, like addressing gays in the milatary and dream act and enforced labor unions. Not that any of these are bad, but they are talking points to give something to catagories of people that do not help our socity grow and solve our issues. Other TV stations are there also - just at different sites. Some in buildings, some on the ground. If you want to complain about money, call Adelson, Kochs, Rove, and all the folks on Wall Street and complain. I heard that in Canada they take over the Northern Lights to show who won. #4moreyears!!!!! Team Obama!!!!! Royal Blue is what I like. Romney and the rest of the right wing nut jobs want to get rid of FEMA. They feel that people should cover themselves through private insurance and other means. Unfortunately, #WreckItRomney and the rest of the right wing do not seem to understand what damage to the public infrastructure actually means. Go ahead, pray for a Romney win. Just remember the warning from Herman Cain when he was at the top of the polls. "If you're not rich by now, it's your own fault." That doesn't sound like he wants any more folks joining his elite rank in society, does it? "everyone vote!!!! for romney!!!! make us school not eat wheat!!!!!!!!!" Verily, verily I say unto you, Blue will be the colour. Surely! How is it that unemployment for African Americans are 14% and 16-19 year old African Americans are at 40%? I'm willing to be that unemployment for white Americans 16-19 years old is much higher, maybe double. Why? Because kids that age are supposed to be in school. Why does not mittens donate some of his wealth to citizens of NY and NJ who are suffering. There's vote-switching going on in PA and WV. CNN wlll not tell you about it, and I doubt FOX will either. Just another misguided diatribe. Do you know why some trades or jobs require people to be union members? It's called skills, training, and experience. A hotel balcony crashed in Kansas City 30 years ago, killing hundreds, because it was installed with inexperienced scabs, instead of unionized workers. That's just one example from just one industry, the list is LONG. Stewart should have a field day with this. Voters in FL were getting robocalls this morning telling them voting was changed to tomorrow. what romney can't win or buy, he wants to steal. I just have a feeling that the lights will add to the lovely blue sky.